As the company's 2019 range currently finds its way into stores across the world, Gibson’s 2018 guitars are subject to some pretty tasty discounts. 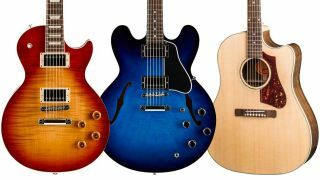 Over at Guitar Center, there are an incredible 70 electric, acoustic and bass guitar models reduced, spanning classic designs like the Les Paul, SG, Explorer, Flying V, Hummingbird, J-45 and much more. Okay, so the biggest price cuts are on the proper expensive stuff - such as the Limited Edition Doves in Flight 12-string, down $1,180 to $6,669 from $7,849 - but there are some solid deals to be had further down the range, too.